DIMITRI LASCARIS: This is Dimitri Lascaris for The Real News. In December 2016, in the final days of the Obama administration, the United Nations Security Council did something it had not done since the administration of George W Bush. It adopted a resolution condemning Israel’s violations of international law. That resolution, Resolution 2334, adopted by a vote of 14 to nothing, with the United States abstaining, stating amongst other things that it reaffirmed the establishment, that the establishment by Israel of settlements in the Palestinian territory occupied since 1967 including East Jerusalem, has no legal validity and constitutes a flagrant violation under international law and a major obstacle to the achievement of the two state solution and a just, lasting and comprehensive peace. Not only was this the first resolution condemning Israel that the Obama administration allowed the Security Council to adopt but there was also something else unusual about Resolution 2334. Namely, it was adopted by the Security Council after an Israeli human rights organization made a direct appeal to the Security Council to act in defense of the human rights of the Palestinian people.In October 2016, two months before the adoption of Resolution 2334, the Director of B’Tselem, Hagai El-Ad, appeared before the United Nations Security Council and said as follows, “For the past 49 years and counting, the injustice known as the occupation of Palestine and Israeli control of Palestinian lives in Gaza, the West Bank and East Jerusalem has become part of the international order. The first half century of this reality will soon be over. On behalf of B’Tselem, the Israeli information center for human rights in the occupied territories, I implore you today to take action. Anything short of decisive international action will achieve nothing but ushering in the second half of the first century of the occupation.”B’Tselem made its extraordinary appeal to the UN Security Council in particularly challenging circumstances. Only a few months before B’Tselem made this appeal, Israel’s Knesset passed a law targeting non-governmental organizations. That law required that NGOs who receive more than half their income from foreign governments report this fact each year to Israel’s Justice Ministry, which would publish a list of these NGOs. NGOs that are on the list must also note this fact on their websites and in any publications related to the NGOs advocacy that are readily available to the public.Now here to discuss all of this with us is Amit Gilutz, the spokesperson of B’Tselem, which has been documenting human rights violations under the Israeli occupation since 1989. Thank you for joining us today. AMIT GILUTZ: Thanks for having me. DIMITRI LASCARIS: Now let’s talk first of all about the NGO law adopted last year. Its critics I understand argued that the law is intended specifically to make life more difficult for left-leaning NGOs that have been critical of Israeli’s treatment of the Palestinian people. Why do they say this about the NGO law and how has that law affected B’Tselem in particular? AMIT GILUTZ: Well the law will have an affect on us, starting in about a year from now, when we file our financial reports for 2017. In them, if our funding for the year, more than 50% of the funding for the year would come from foreign governments, then we would have to declare that on our publications and in interviews that we give to portray us as though, because we do, we promote human rights and the human rights of Palestinians and we work to end the occupation, we are in fact serving the interests of foreign governments rather than the interests of all people living between the Jordan and the Sea.This has to be seen as, not as an isolated event, but as a piece of legislation that is part of a slew of legislative initiatives that has the same purpose, which is to vilify human rights organizations and in particular, organizations that work against the occupation. 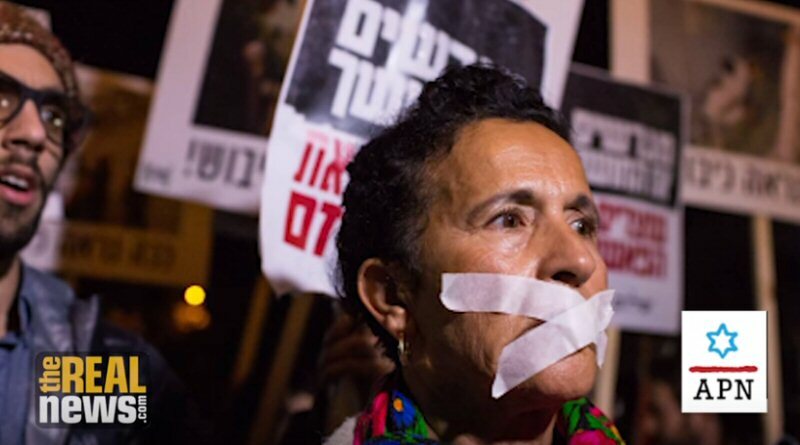 The shrinking space, the shrinking democratic space in Israel is not affecting only human rights organizations, but also journalists and academics and artists. This is a process that we’re in. We think that it is part and parcel of the fight against the occupation. I also want to note that recently Prime Minister Netanyahu had a new initiative for a new law that would actually completely rob the possibility of getting this funding from foreign governments. DIMITRI LASCARIS: What are the prospects for that law being adopted by the Knesset? AMIT GILUTZ: It is hard to say. It seems like this proposal, this bold proposal even I would say, has to do with the Trump administration being in the background. Certain officials have expressed that. We can’t predict if it’s a good path or not, but to go back to your previous question, these laws are specifically targeting organizations that are working for the human rights of Palestinians, both Palestinians in Israel and in the occupied territories, refugees and asylum seekers. DIMITRI LASCARIS: Now when Hagai El-Ad, the Director of B’Tselem made his appeal to the UN Security Council last year, how did the Netanyahu government react to that appeal in particular? AMIT GILUTZ: They reacted predictably I would say, and again within this context that I’m talking about where the government incites an atmosphere of witch hunt that doesn’t stop of course in the Knesset, in the Parliament, but affects the public as a whole. After the speech, voice from the government proposed to deny or to revoke Hagai’s citizenship, which is a very extreme measure and it has no legal basis, but just making that statement is part of this campaign. It’s not only from the government, it’s not only from the public. There are also other NGOs that are very closely related to the Israeli government that further incite.There was a campaign in 2015 that portrayed Hagai specifically as well as other prominent figures in the Israeli left as moles, essentially as traitors, as people who are serving foreign interests and working against their own people. Although the specific law, the NGO law hasn’t had an effect on our work as of yet, we have been experiencing this process. We’ve received threats. Our website has been attacked. There have been rallies and demonstrations against venues where we held events, but it’s also very important to be clear that all of this is nothing in comparison to the lived experience of Palestinians living under Israel’s military occupation. DIMITRI LASCARIS: I’d like to talk about that experience, particularly since the adoption of Resolution 2334 in December of last year. The resolution used quite vigorous language as I indicated, referring to the settlements, which have been repeatedly acknowledged by the international community to be a violation of the fourth Geneva Convention. It called those settlements a flagrant violation and called on states to take appropriate measures but did not, the resolution did not, like all of its predecessors in the Security Council and the General Assembly impose any meaningful concrete penalties on the state of Israel for its continued violations.It’s I think instructive to examine what’s happened since the resolution was adopted. How have the conditions on the ground for the Palestinian people in Gaza and the West Bank and East Jerusalem changed materially if at all since December of last year? DIMITRI LASCARIS: I mean if we might just turn our attention a bit to Gaza. DIMITRI LASCARIS: How has the situation in Gaza unfolded since December of 2016? AMIT GILUTZ: Yeah, so you know in 2015 there was a UN report that predicted that by 2020, if current trends continue, Gaza would become uninhabitable. Just to remind the viewers, this is one of the most densely populated areas in the world. More than 50% of the population there is under 18. 2020, even in 2016 wasn’t such a long time in the future, but now, a new report came out saying that the rate of the deterioration of the conditions in Gaza is even faster than originally thought.Currently there’s a huge electricity crisis in Gaza. I mean this is ongoing. This is not something new actually, but the deterioration is new, so currently people in Gaza receive an average of four hours of electricity a day. Sometimes less than that, sometimes a little bit more than that. Never in a predictable time, so they don’t know in advance when the electricity will come.I think we all need to stop and just imagine what that means in the heat of summer in the Middle East, to be forced to live in this way. Of course this affects public health. It affects public institutions as well as the complete inability to lead any kind of routine life. DIMITRI LASCARIS: To sum up, have you seen, have we seen any material improvement in Israel’s behavior towards the Palestinian people since Resolution 2334 was adopted in December of last year? AMIT GILUTZ: Right, so about the resolution, there’s actually a very important clause in the resolution, which is the fifth clause, which asks the member states to differentiate in the relevant dealings between Israel proper and the occupied territories. Every three months the member states have to report to the Security Council on the implementation of the resolution. So far there have been two such reports and there haven’t, we haven’t seen substantial advance towards the implementation of that cause.We certainly call on the member states to implement the resolution according to its own terms. This form of differentiation alone of course would not bring it into the occupation, but it would be a step in the right direction. DIMITRI LASCARIS: Right. How about East Jerusalem? There’s been quite a big of protest there recently relating to measures taken by Israeli security forces around the Al-Aqsa mosque. Can you tell us about those measures and how the Palestinian population has reacted to them? AMIT GILUTZ: Yeah. One layer of the measures is restriction, a very high degree of restriction of access to the Al-Aqsa compound specifically but also in different times to the Old City as a whole. Also the placement of manned checkpoints at the entrance to the compound. This is what really make Palestinians protest non-violently, in their decision to not enter the compound. The vast majority of them did not enter the compound but held their Friday prayers last week outside of the compound, as a protest against these new checkpoints.We’ve seen Israel also end in very huge amount of military and police to deal with these protests or to deal with the prayers and used excessive force. Over the weekend there have been four deaths of Palestinian protestors. A hospital in East Jerusalem that was taking in injured people from the protests was raided by the police. This is completely unjustifiable. Even if they wanted to arrest people of course a hospital is a no-go zone.There were stun grenades and tear gas used outside the hospital. All of this just shows the complete disregard that Israel policy makers have for the value of Palestinian lives, their well-being and their right to lead a normal life with normal opportunity. DIMITRI LASCARIS: Lastly, I’d like to ask you about the 50th anniversary of the occupation. When Hagai El-Ad made his eloquent appeal to the Security Council, we were nearing the end of the first half century of the occupation. Of course as I mentioned, the international community has long recognized, and universally recognized virtually the illegality of the settlements. The occupation itself, given the duration of the occupation, given that there’s no end to it in the foreseeable future and given that it’s becoming increasingly entrenched in the ways that you’ve described, what is B’Tselem’s views as to the legality of the occupation itself under international law? AMIT GILUTZ: Yeah. You know this is an ongoing debate among international law jurists. It is undecided and we don’t take a position on this question specifically, but I do think that the more important question perhaps is what is legitimate? What kind of behavior is more? It’s very clear that the way that Israel manages the occupation is wholly illegal, whether we’re talking about the use of lethal force without any justification, the settlement enterprise as a whole, and many other forms of violations of Palestinian rights.It’s very clear that Israel has no intention of ending the occupation. It is not designed as a temporary situation. It is designed to become ever more entrenched, and it’s very clear that the rights of all people living between the Jordan and the Sea, and justice to these people will only come when we’ll see an end to the occupation. DIMITRI LASCARIS: This is been Dmitri Lascaris speaking to Amit Gilutz, the spokesperson for B’Tselem, the Israeli information center for human rights in the occupied territories. DIMITRI LASCARIS: Thank you for joining us, and this has been Dimitri Lascaris for The Real News.